Coming Up: Jon Paul falls for a Mormon—just not the one he was expecting. God’s honest truth: my new Broadway boyfriend is a closeted, tap dancing religious fanatic. 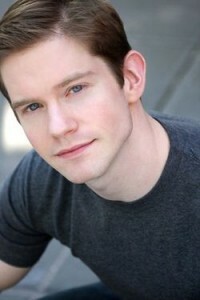 That’s right, Book of Mormon’s Rory O’Malley has stolen my heart. 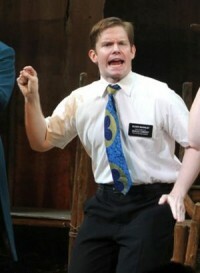 No, he doesn’t play the dashingly handsome Elder Price nor the endearingly quirky Elder Cunningham. Instead, O’Malley’s Elder McKinley tapped his way to a Tony-nomination by lighting up the stage with “Turn it Off” an ode to keeping those certain urges closeted. It’s the subtlety that O’Malley brings to the part that caught my attention—I couldn’t take my eyes off him waiting for one more suggestive facial expression or roll of the shoulders. To me, he’s the unsung hero in this cast of standouts. I expected to leave the show in love with goofy Elder Cunningham—thinking that not since Seymour in Little Shop of Horrors had there been a lead role atypical enough for a theater nerd like me (let’s face it, I’ve never been tall or traditionally handsome enough to be cast as the romantic lead). But O’Malley changed my tune—he’s made a juicy role out of a supporting character that should have Gleeks singing for joy and polishing up their tap shoes. Bless you, O’Malley. Here’s the thing: I don’t have very much to add to the revelatory praise being righteously heaped on Broadway’s Tony-winning extravaganza The Book of Mormon. Suffice it to say that everyone is right—it’s a miracle that might just draw the younger South Park fans to the Great White Way giving theater a boost of immortality. My gushing feelings for this spectacular is similar to when Avenue Q’s rascally blend of wit and heart opened and I insisted every out-of-towner buy a ticket. No surprise then that the blend of talents from Trey Parker & Matt Stone (South Park) and Robert Lopez (Avenue Q) with a dash of Casey Nicholaw (Drowsy Chaperone) results in this love hilarious love letter to Broadway fans. Together, they’ve constructed a show that is lean, moves quickly, never misses a single opportunity or laugh. And just when I was wondering, “How are they going to make this not seem like a sad joke for the Africans?” they pull it off in a stroke of genius that had me grinning from ear to ear. So let me just wrap up with a few well-worn clichés that I’ve been putting off: Run, Don’t Walk to see this show. If you only see one Broadway show, this should be it. Book of Mormon—it’s even better than Cats. This entry was posted in Featured, Tex And The City and tagged book of mormon, casey nicholaw, matt stone, robert lopez, rory o'malley, trey parker. Bookmark the permalink. Log into Facebook or fill out the form below to join the discussion.